Following news of their divorce, rumors swirled that Luann caught Tom being unfaithful, and that she was even rekindling things with ex-boyfriend Jacques. Reportedly, Luann and Tom even had a very public fight where she slapped him. Luann has already denied that infidelity played a role in their split and explained that they simply grew apart. Which is kind of what cheating is, right?! Now a source claims that we’ve had it all wrong and that Luann never considered Tom anything more than a showmance. The source told The Daily Mail that Luann only married Tom because she was “becoming irrelevant on [RHONY] and needed a new story line,” which is why she was never bothered by his affairs and Housewives hookups. And contrary to the Legend Of The Head Of Heels In Love Luann, the source insists it was actually TOM who was madly in love with her and is having a “difficult time” accepting that he was used for RHONY. Has he been talking to Jason Hoppy lately? Yes, apparently Tom was soooooooo in love he cheated, right?! The allegations go even further, accusing Luann not just of being unfaithful, but also asserting that she “was prone to violent outbursts,” which left Tom bruised and bloodied. “It does not take much for her to punch, bite, slap or scratch him,” the insider revealed. Is that source Ramona? Personally, I think Luann got caught up in the idea of finding love again, and when Tom cheated, she dug her heels in to prove their love was real and avoid embarrassment. Luann didn’t appear to be faking happiness. It’s sad they could not work it out, but it was probably for the best. Perhaps the third time’s a charm for the Countess no-more! Luann changed her last name back to “de Lesseps” on Twitter and Instagram, so that means this divorce is like for-realz, y’all! TELL US – DO YOU THINK LUANN ONLY MARRIED TOM FOR RHONY?! WAS SHE UNFAITHFUL AND ABUSIVE? 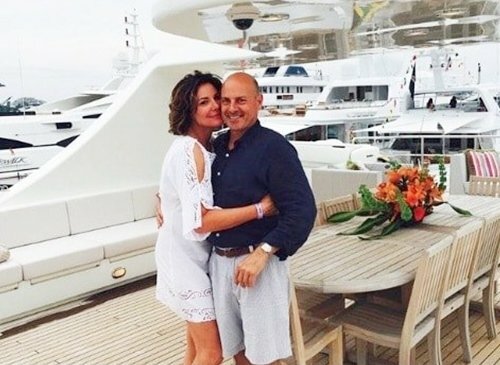 Tags: Luann De Lesseps, LuAnn de Lesseps divorce, Luann de Lesseps engaged!, Luann de Lesseps Married, Tom D'Agostino, Tom D'Agostino Jr.